Every year, antivirus makers add new features to their Internet Security packages. But the Finnish security company F-Secure took a different path. Instead of bloating up their products with tons of features you might never even try, they chose simplicity. F-Secure Internet Security includes only an automatic antivirus, a browser protection, and a banking protection. No gimmicks, just useful features that protect your PC. It's this same simplicity philosophy they applied to their VPN product, called F-Secure Freedome. 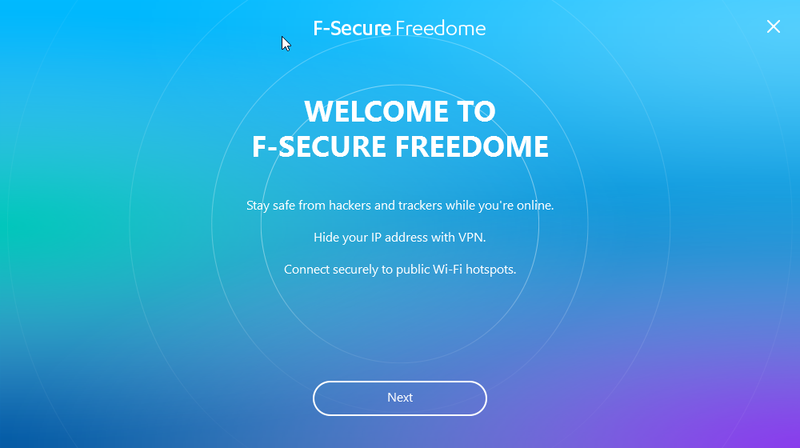 Contrarily to most VPN providers, the devices number limit is not the number of connections allowed at the same time, but rather the number of devices on which you can install F-Secure Freedome. 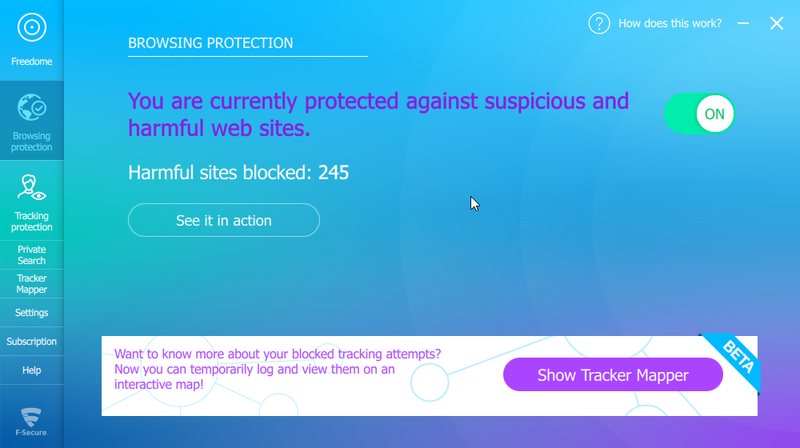 F-Secure Freedome comes with a unique feature set: it includes Browsing Protection, protecting you against suspicious and harmful website, and Tracking Protection, blocking ad companies and retargeting trackers. On Android, there's also an App Security component, which is in fact a built-in cloud antivirus, able to protect you from harmful Android apps, viruses, spyware and malware. Installing Freedome on Windows is easy and fast. Stay Safe from hackers and trackers while you're online. Hide your IP Address with VPN. Connect securely to public Wi-Fi hotspots. know what traffic is yours. After clicking on accept, you'll see a white orb with a blue line spinning, bearing the word INSTALLING.... Then, you get the usual install a network adapter from Windows, which you'll have to accept. Then... nothing. The installation is over. The main UI of Freedome opens, revealing the same big white centered button. The UI is organized around the enormous white button in the center, which purpose is to switch the VPN protection ON or OFF. On the left-hand side, you'll find a traffic counter displaying how much data you used through Freedome - of course, this value is only for your information, as traffic is unlimited -. On the right-hand side, two counters are present: one is telling you how many harmful sites were blocked by Freedome while the other is counting the tracking attempts it stopped. There's also a sidebar to access the other settings. The first icon in the sidebar leads you to Browsing Protection. This screen contains a toggle to switch the protection against malicious websites on or off. Next in the sidebar comes Tracking Protection, with this time again a toggle, and a counter. 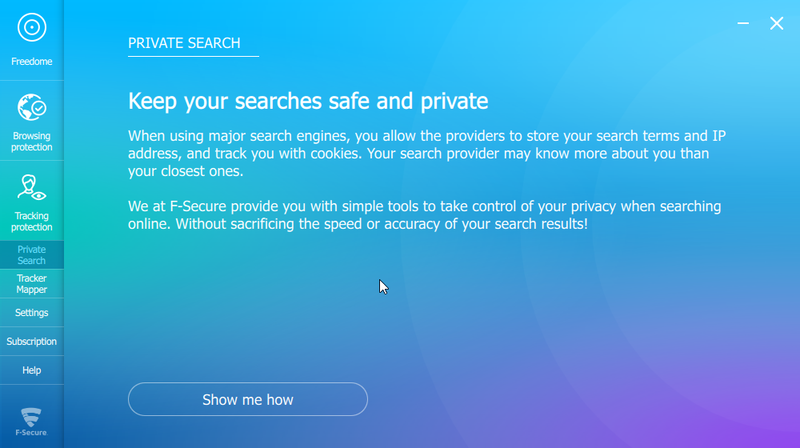 Private Search is just a link pointing toward F-Secure-owned search engine. 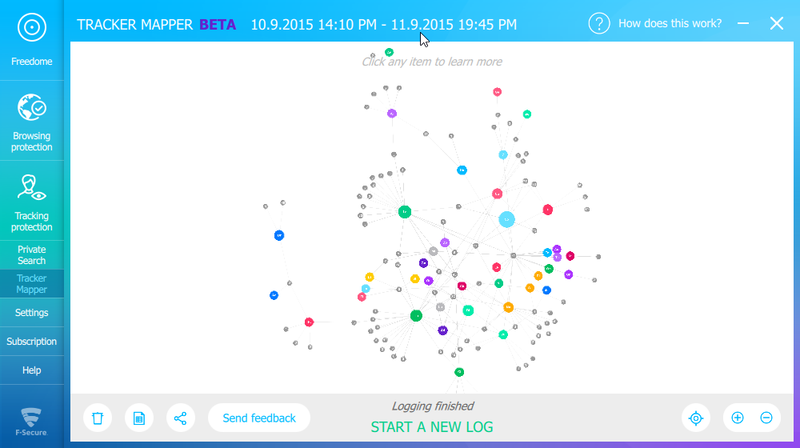 And now comes another innovative feature, which is now in beta: Tracker Mapper. Tracker Mapper creates a map of the websites you visit, allowing you to visualize the trackers tracking you, and the complex relationships they have with websites. The colored circles represent the websites you visited while the smaller, greyish dots are the websites that tracked you. This feature reminds me of the add-on for Chrome called Disconnect, which has a button called 'Visualize page' button that "lets you graph the requests on the site". Even if the penultimate button is called Settings, you won't find lots of customization options in it. In fact, you can only change if you want Freedome to start when you boot your computer. There are no connection settings, nor encryption options. Everything is automatic. That's great if you're looking for a super easy to use VPN where everything is automatic - but that less great if you're a power user who wants to customize everything to your liking. Finally, the last button before the Help link is Subscription. As you may have already noticed, Freedome never asks for a username or a password. That's because the licensing of Freedome is rather based on subscription codes you buy, then activate on a device, instead of signing in with your account. That way, there is no risk of getting the account linked to your subscription hacked or compromised: the subscription is tied to your device, not your F-Secure account. F-Secure Freedome is even easier to install on Android, as you just have to download it from the Google Play Store. The UI language is the same as the Windows version, with its enormous central button to connect or disconnect. The different shields that protect you are represented by concentric circles around the central button. Compared to the Windows version, the UI is better adapted to touchscreens, since you slide up and down to reveal further options of the free-dome. While we don't know how many servers are present at each location, this list makes up for an impressive diversity in countries. 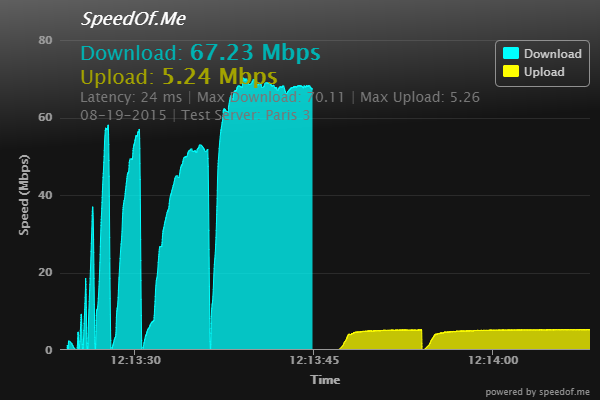 I tested Freedome on a French 70Mbps cable line, and this is the result I got on SpeedOf.me. 67.23 with the VPN instead of 70Mbps without the VPN is an excellent result. Freedome is one of the fastest VPN services I've tested so far. 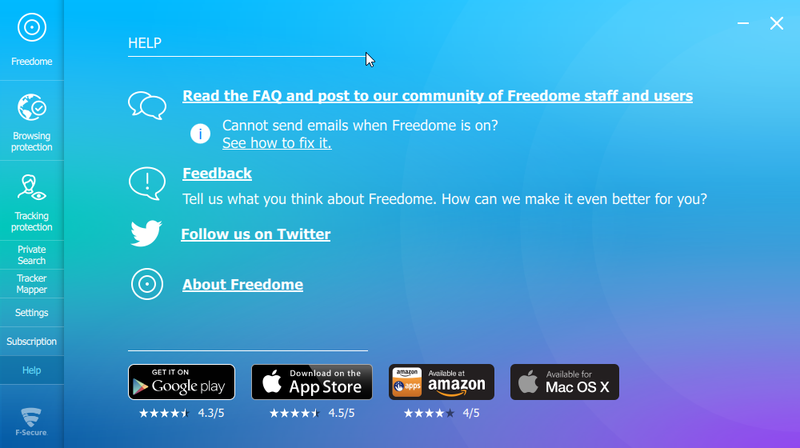 Unfortunately, when it comes to support, Freedome is a bit lacking: you can read the FAQ, and if you don't find your answer, the user community is your last hope. 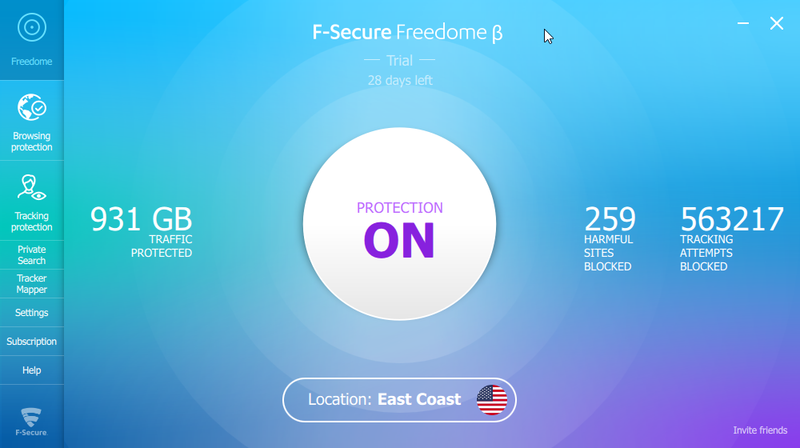 To sum up, F-Secure Freedome is a nice VPN service, with a sleek interface, pretty fast speeds, and innovative features like browsing protection which can truly improve your web experience. The only downsides are the lackluster support options. You can't change any encryption or connection setting. Support seems to be limited to FAQ and community forums. No Linux client... for now. A five-day-trial is on the short side. 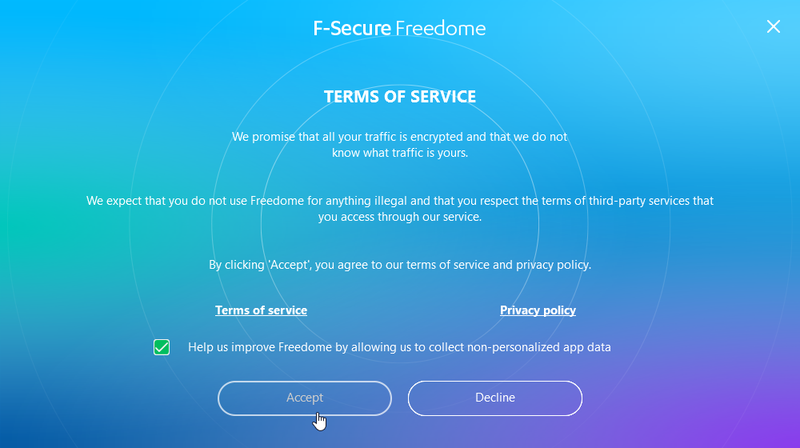 What do you think about F-Secure Freedome? Do you prefer VPN services with limited customizations, but simple and clear UIs, or VPN services with a UI which wouldn't win any beauty contests, but offer plenty of features and lots of toggles and dropdowns for settings you can change?